With the introduction of the polarized sensor, the world of machine vision has a new method of inspection. Complex tasks like surface inspection or detection of tensions and particles in transparent materials are much easier to do with a single image shot and some maths without complicated light settings. Apart from brightness and wavelength, polarization is part of the fundamental properties of light. Our exo250Z camera with the new IMX250MZR Sony sensor can capture polarization information which cannot be detected by conventional imaging devices. This opens the door to novel applications in industrial machine vision applications and beyond. Prominent examples include the analysis of the orientation of carbon fibers, the visualization of tensions in glass caused by stress induced birefringence, the reduction of reflections and glare or simply the enhancement of contrast between materials that are difficult to tell apart with conventional imaging modalities. Machine Vision applications often rely on the automatic analysis of digital images. The images themselves contain information on the interaction of light with the materials of interest. The type of information captured in the images is dependent on the image acquisition technology employed. The digital monochrome or color camera in combination with adequate optics might be most commonly used in industrial machine vision implementations. They capture the intensity distribution and, in case of the color camera, additionally information on the wavelength of the reflected or transmitted light of the objects of interest. It should be appreciated that light carries additional information that can be used to probe target objects. The lights electromagnetic waves are characterized by their intensity, wavelength, phase and polarization. With our new polarization camera, information on the spatial distribution of the polarization state of light can actually be captured. The polarization is a property that characterizes the geometrical orientation of the oscillation of the electric field of light. Linear polarized light, for example, is light that oscillates only in one plane perpendicular to the direction of propagation. Figure 1A visualizes a linearly polarized wave of one wavelength. Additionally, the figure shows circular polarization (Figure 1B). It can be obtained by transmitting linear polarized light through optical active media for instance. 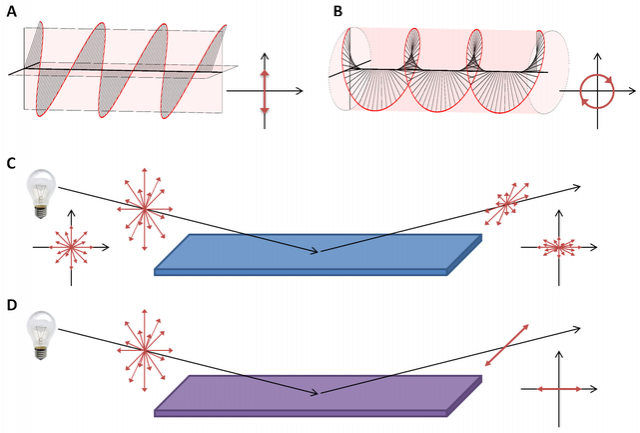 In this paper we will focus primarily on linear polarized light. Light that we encounter in our natural environment from most common light sources is typically unpolarized, i.e. the light consists of a multitude of waves with oscillation orientations that are statistically distributed (see Figure 1C, left). An interesting effect occurs when this unpolarized light gets reflected off dielectric materials like for example glass. These materials show a reflectivity that differs for polarization components that are polarized parallel to the surface normal of the material compared to the components that are polarized perpendicular to it. The difference in the reflectivity is dependent on the reflective index of the material as well as on the incident angle. Thus, the reflected light typically shows a partial polarization (Figure 2C, right). Incident light at a specific angle, the so called Brewster angle, has the interesting property that only polarization components perpendicular to the surface normal are reflected, resulting in linear polarized reflected light (Figure 1D). Simply put, linear polarized light can be thought of as an addition of two coherent waves along two orthogonal directions. An optical active media can show a different refractive index for polarizations along these two directions, such that the two partial waves propagate with different speed through the media and acquire a phase difference. The addition of these two phase shifted waves results in elliptical or circular polarization, as the resulting electric field vector turns in an elliptic or circular pattern (Figure 1B). Circular polarization is obtained for a phase shift of exactly 90°. 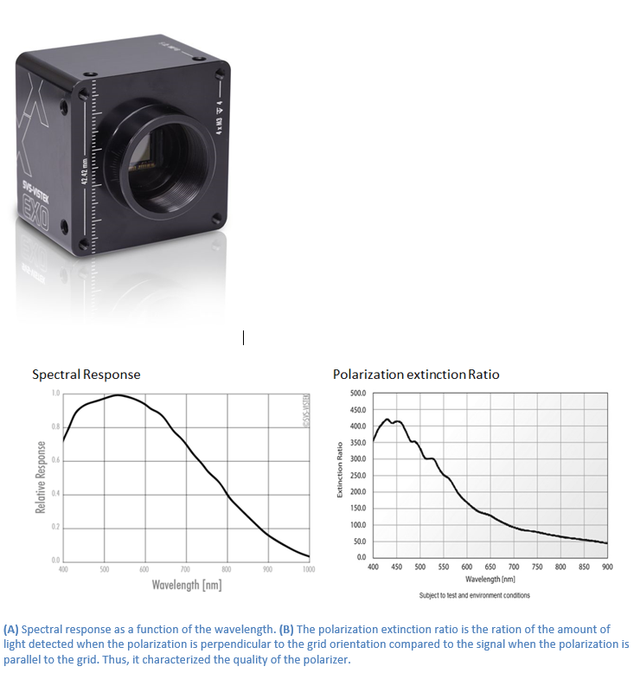 In order to characterize the polarization of light linear polarizers can be used. They are an easy and efficient way to obtain linear polarization from unpolarized light. Multiple realizations of polarizers exist and explaining them all would surpass the scope of this paper. Here we want to focus on the grid polarizer. This is an optical element consisting of an array of sub-wavelength parallel metal nanowires. The component of the incident electric field that is polarized parallel to these metal wires is blocked such that only the polarization components perpendicular to the nanowire grid is transmitted (Figure 2A). These nanowire grids are employed in our exo250Z camera. Our exo250Z camera series utilizes the newly developed IMX250MZR Sony sensor. This sensor is based on the popular pixel, 2/3” IMX250 CMOS sensor with 3.45µm pixel size. 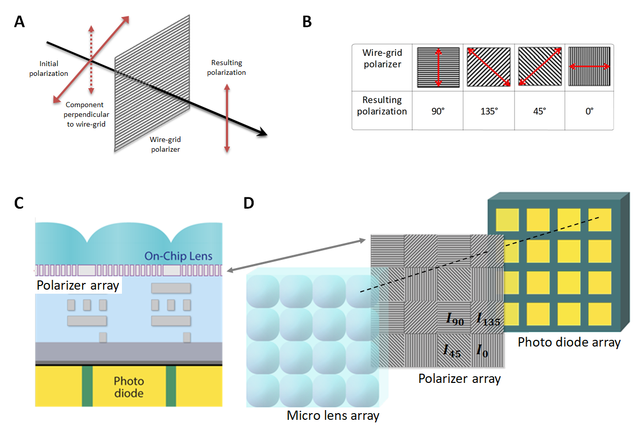 A four-directional polarization square filter array is overlaid directly on top of the pixel array and beneath the micro lenses (Figure 2C, D). This filter consist of repeated 2x2 patterns consisting of grid polarizers with four different angles at 0°, 45°, 135° and 90° (Figure 2D). Each polarizer filters the incoming light such that only the polarization components perpendicular to the grid orientation can pass through and be detected by the underlying photodiode. Thus, a four directional polarization image can be captures in one shot. In subsequent post processing this image can be used to obtain four images filtered by one polarization filter, respectively. Additionally, the images can be used to estimate the spatial distribution of the brightness of each 2x2 pattern by averaging, as well as the associated linear polarization angle and the degree of linear polarization (Figure 3). Examination of these values provides an imaging contrast enhancement in a multitude of applications compared to standard camera imaging, as shown in the following application examples. Please note that the fourth Stokes parameter , which is calculated from the intensities of right and left circular polarized light, cannot be obtained from the image. The inverse tangent needs to be computed such that it returns values in the closed interval. 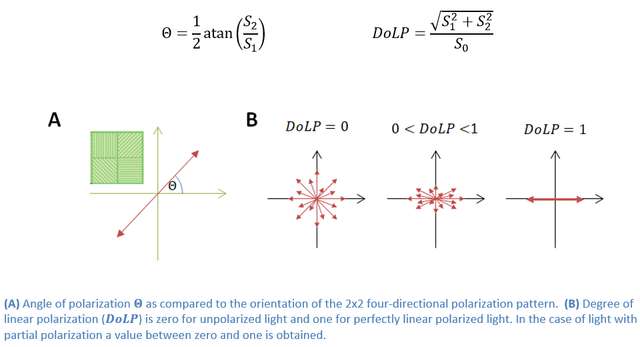 Calculation of the spatial distribution of the polarization angle as well as the degree of linear polarization increases the information content of the measurement. Many applications exist for such measurements, for examples the analysis of the orientation of carbon fibers, the visualization of tensions in glass caused by stress induced birefringence, the reduction of reflections and glare or simply the enhancement of contrast between materials that are difficult to tell apart with conventional imaging methods. Subsequently, some application examples are shown. The EXO series polarized is available with USB3 interface and with GigE vision interface). 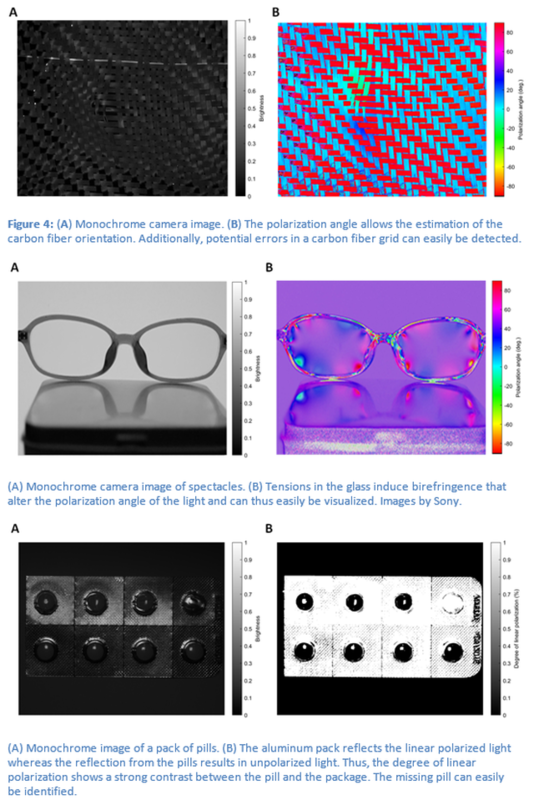 In terms of optical (polarization) properties, both cameras perform identically. Select the best interface for your application.